Sri Dharbaranyeswara Swamy Devasthanam, Tirunallar is unique in its kind and is dedicated to Lord Saneeswaran Bhagawan where the Lord is a blessing God having ABHAYAHASTHAM. The main deities of the temple are Lord Shiva as Darbaraneswarar and Goddess Parvathi Devi as Pranamambika (or) Bogamartha Poonmulayal. As per the Indian Astrology, Lord Saneeswaran(the Lord Saturn, one of 9 Navagrahas) moves from One Sign to the next in the Zodiac once in two and half(2.5) years. 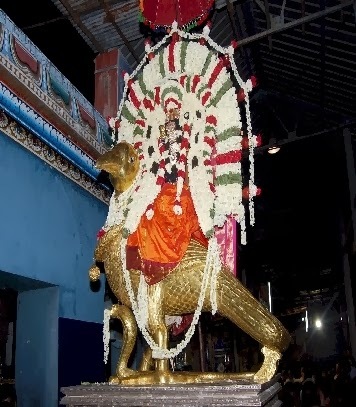 The day on which Lord Shani transits is being celebrated as a SANIPEYARCHI Festival in Thirunallar Temple. On the day previous to the day of transit religious discourses and entertainments are arranged by the temple authorities. On the day of festival DEVARAM ISAI are chanted @4:00am in front of Lord Saneeswaran in the Garbhagriha. An Special Abhishegam is performed to the Lord on a grand scale. A procession of Lord Saneeswara on Golden Crow Vahanam will take place in the evening on this festival day. Devotees can participate in Procession of Lord Sahni Bhagawan on this festival day. Lakhs of devotees visit the temple not only from different parts of India but also from abroad and have the blessings of the Lord during the Sanipeyarchi festival. An Eighteen day festival is celebrated in the Tamil month of Vaikashi when the sun resides in the sign of Taurus. Festival of Sri Nataraja Swamy(the Lord of Dance) is being celebrated in the Tamil month of Aani(Gemini). Sri Tyagaraja Swamy procession is taken place on the day of Tamil's New Year Day(the day on which the Sun transits from Pisces to Aries according to Indian Astrology). Navaratri Festival(September/October) and Karthika Deepam Festival(November) are also being celebrated in a grand manner.